The Governor's Mansion, initially built for Albert Gallatin, was sold in 1887, to Joseph Steffens father of the nationally recognized author Lincoln Steffens who resided in the home during his boyhood years. The senior Steffens was president of the Sacramento Chamber of Commerce and was well known at the time for his racing stables. In 1903, the home was sold to the State of California as the Executive Mansion. Governor George Pardee became the first resident of the new mansion that same year. During its sixty-four years as the Executive Mansion, thirteen governors resided here. The longest resident was Earl Warren, who vacated midterm in 1953 after ten years, to become Chief Justice of the United States Supreme Court. The State Fire Marshall declared the house unsafe for occupancy in 1941; however, it was not until 1967 when Governor Ronald Reagan moved from the residence that it was established as a state landmark, open and available for tours. 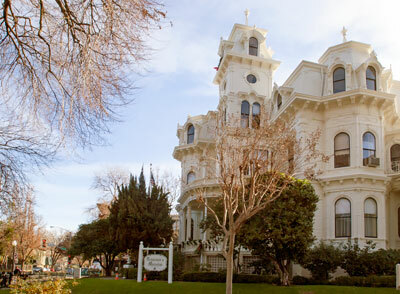 The California Governor's Mansion is also California Historical Landmark 823.